BMW’s new 5-Series sedan can drive itself at speeds as fast as 210km/h, turn up the radio with the wave of a hand and warn other cars of fog. But you might not know it has all that gadgetry by looking at it. While BMW has packed one of its biggest profit makers with its latest technology, the styling is far more traditional. Taking cues from the underwhelming 7-Series flagship, the car sports a broad grille, chrome-framed side air vents and squinting double headlights. BMW’s growth next year hinges on the 5-Series, which was officially unveiled in Lisbon this week and generates as much as a fifth of its automotive profit. The Munich-based manufacturer can ill afford anything but a runaway success to hit back at Mercedes-Benz, which this year will grab BMW’s crown as the world’s bestselling luxury brand for the first time in a decade. The roll-out of the sedan is also an important test for CEO Harald Krueger. While he took the reins just months before the larger 7-Series was introduced in 2015, the 5-Series came to fruition under his direction, and he needs a lift from the overhauled sedan — which also comes as a plug-in hybrid — to fund plans to develop a driverless electric car by 2021. 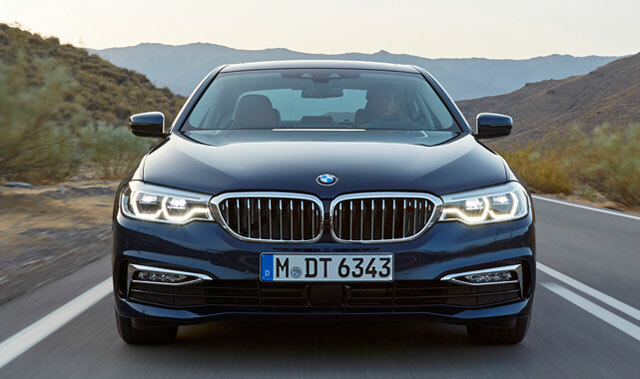 BMW is packing some of this next-generation technology into the US$47 700 sedan, which is due to hit showrooms in February. In addition to self-driving features on highways, the car can tell other vehicles in the vicinity that it has turned on its fog lights to warn of low visibility. When parking, a camera focuses on nearby objects to help avoid collisions. The heads-up display, which projects speed and navigation directions on the lower part of the windshield, shows three-dimensional images. 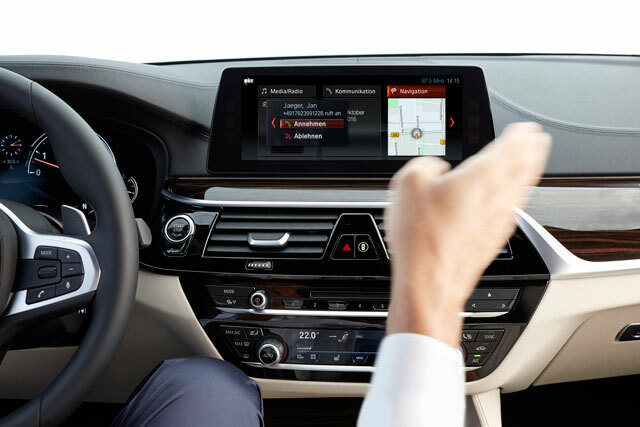 Climate control and other functions are operated by touch screen rather than knobs and dials, while entertainment and communication features also respond to hand gestures. Pointing a finger at the dashboard screen, for example, picks up a phone call. Less innovation is evident in the design, as BMW opted to play it safe rather than follow Mercedes with a more radical styling makeover. Still, the car’s perch atop the business sedan segment is under threat. The Mercedes E-Class, which was overhauled earlier this year, is projected to outsell the 5-Series next year amid the customary slowdown as showrooms and buyers adjust to the new model, according to IHS Automotive. The 5-Series was BMW’s second-biggest seller after the smaller 3-Series last year, and with a margin that’s higher than most of BMW’s models, it’s crucial for the manufacturer’s financial targets, which have been under pressure amid an aging lineup and increased investment. BMW’s return on sales from car-making fell to 8,5% in the third quarter from 9,1% a year earlier. The 5-Series, which typically delivers a profit margin in the upper range of BMW’s target of between 8% and 10%, according to estimates from Evercore ISI, will be counted on to provide a boost. BMW is betting that the advances under the bonnet and a consistent design will be the right combination.